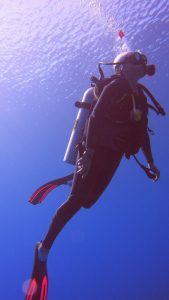 Home » Hobbies » Diving » Swimming with Sharks – HUNDREDS of Sharks! We sailed to Fakarava, which is the second largest – and one of the more populated – atolls in the Tuamotos (the other being Rangiroa). 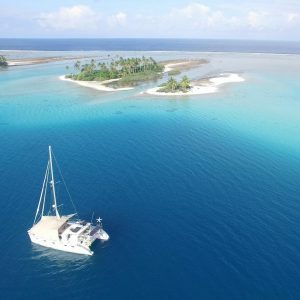 Fakarava’s lagoon is more than 30 miles long and unlike any other atoll we’ve visited, you can traverse the entire atoll in a beaconed, buoyed, well-marked channel. I still stayed on watch on the front pulpit the whole way across, but never saw a bommie the whole way. This atoll is home to over 800 people as well as a number of pearl farms, resorts and tourist attractions, and an airport that actually has regularly scheduled flights. Fakarava feels like a metropolis after so long so far off the grid. The only problem is we realize we like being off the grid! Arriving in Fakarava, seeing other boats and buildings, we immediately felt “homesick” for the deserted atolls we’d just left. We realized we’ve become Tuamoto-recluses; we prefer the seclusion of the unpopulated atolls and come to “civilization” reluctantly. 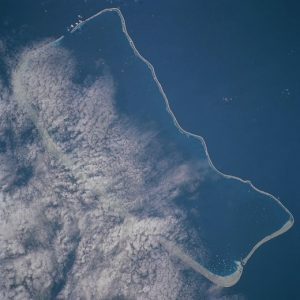 We enjoy the Polynesian locals we’ve met and the company of fellow cruisers, and it’s nice to swing into the inhabited atolls briefly for internet and provisions, but there’s nothing better than hanging out on the atolls where it’s just you and the wildlife sharing these peaceful lagoons. The Tuamotos, especially the deserted atolls, are the idyllic South Pacific we’ve been dreaming about: white coral islands with swaying coconut palm trees surrounded by turquoise emerald water teeming with sea life. When you’re in such a beautiful place with no one else around, it’s magical. So why did we venture to Fakarava? 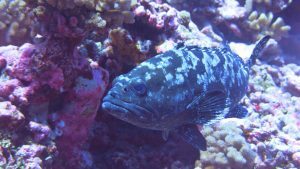 For one reason only: the once-a-year spawning festival by the marbled groupers that is on display better than anywhere else in the world in Fakarava’s south pass at the full moon after the summer equinox. Normally about 20,000 grouper spawn at one time. They choose the outgoing tide so that their eggs are taken out to the open Pacific where they have less chance of being eaten by the concentration of predators in the lagoon. Still, circling around the groupers are not just sharks going after the parents. There are also schools of fish that swim through the bursts of egg releases to gobble up this rare caviar. Groupers prefer the deep. All through the Tuamotos, and everywhere else we’ve seen these shy fish, we’ve noticed they hang out near the bottom, skirting into caves or under rocks the minute they spot a shark or shark-sized diver like us. At spawning time, the camouflaged females, their big bellies full of eggs, hover just over the bottom of like a shimmering carpet. 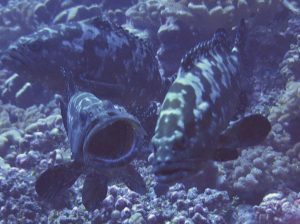 The paler, solid-grey male groupers drift above them, becoming animated with open mouth displays of force in a contest for dominance when another male swims by. The winning alpha male becomes the fish that gets to engage with the female in a swirling upward dance the moment she releases her eggs. The other males join in the race to deposit their sperm into the midst of her eggs, but the loss of just a second or two makes them less likely to reproduce and the genes of the more powerful male more likely to continue on. Darwinian natural selection at work. Realizing we would have the best vantage point from at least 80 feet down, we decided to scuba. We scuba’d down about 80-90 feet to the bottom of the pass and swam just above the coral watching the grouper for about an hour on the first dive. Our tanks were filled with Nitrox and we’ve never felt so energized and good after a dive, especially one that long and deep. 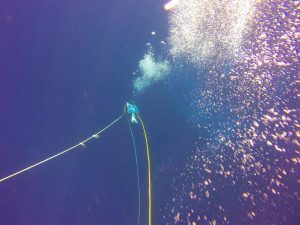 After scuba diving and getting the lay of the underwater terrain, we began using our own replenishable electric-powered snuba for slightly shallower dives that still let us see the sharks and groupers. Our air compressor is portable and fits neatly in the dinghy. We have 120 feet of air hose for each of us, but we found it worked best to dive one at a time, with the other person staying in the water by the dinghy, swimming to keep the dinghy over the diver and holding the hose and playing it out as the diver got deeper. 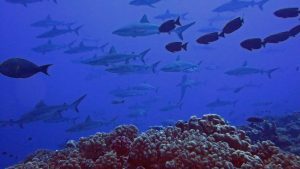 Not surprisingly, the presence of so many preoccupied, juicy grouper draws a huge number of opportunistic sharks who come to Fakarava just for the spawning. They feed on the grouper, mainly at night. The feeding frenzy gets ferocious, with sharks injuring one another in the melee…and divers could easily get caught in the fray and hurt. That’s probably why dive shops don’t do night dives during the spawning. There are so many sharks that they form what’s known as a “Wall of Sharks.” The sharks are so numerous, you couldn’t swim across the pass without finding a break in the traffic. Crossing guard needed! It was surreal to hide ourselves behind the coral at the edge of the bottom trough of the pass and have sharks in such number swim by. We learned that if you want to attract sharks, carry a plastic water bottle that’s been cut in half. Squeeze the bottle and the underwater crackling or vibration from the plastic in the water is a sure-shark-attractor. The scuba operator we dove with also wanted us to wear full wetsuits. I asked if the water temperature was chilly at the depths we’d be diving or if this was to protect us from the sharks. Nope. The reason for wearing long wetsuits was the coral. To see the grouper and sharks, you swim down to the very bottom of the pass and hold on to dead coral so the tidal current doesn’t sweep you away. In that position and with the strong currents, it’s easy to brush against the coral, and wounds from coral not only hurt like the dickens, they also take forever to heal and can easily become infected, which is why the long suit is recommended to protect against scrapes. We would come back to Fakarava at the July full moon again to dive and watch the amazing grouper spawning spectacle! Thanks to Rand Pipp – Pipp.com for taking such wonderful photos! 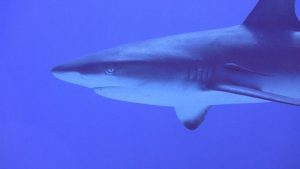 2 Comments on Swimming with Sharks – HUNDREDS of Sharks!